Fuel jug spout and vent kit, only fits plastic cans. For use on portable fuel containers manufactured prior to January 1, 2009. Kit includes spout and cap, second cap for spout or can vent, 1/2" replacement push in vent, second base cap to fit additional cans and flame arrester. Replacement water jug spout and vent kit. Kit includes spout and cap, second cap for spout or can vent, 1/2" replacement push in vent, second base cap to fit additional cans and a filter screen. Made of durable, rust- and dent-proof, high-density polyethylene with convenient back and top handles for easier pouring. Self-venting spout. Dimensions: 14.25" x 8.50" x 18.5". EPA-approved gasoline fuel can. Thick can walls and sturdy fuel spout. Long-lasting and durable. Includes new flame-mitigation device (FMD). High flow fuel replacement spout and vent kit. For use on portable fuel containers manufactured prior to January 1, 2009. Kit contains spout and cap, 8" spout extension for hard to reach tanks, 1/2" replacement push in vent, second base cap to fit additional cans and a flame arrester. 7/8" opening, fast fueling for off road equipment, tractors, boats and more. High flow water replacement spout and vent kit. 7/8" opening, fits most old style water jugs and cans. Kit includes spout and cap, 8" spout extension for hard to reach tanks. 1/2" replacement push in vent and second base cap to fit additional cans. 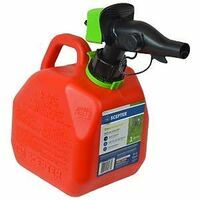 EPA-approved gasoline fuel can. Thick can walls and sturdy fuel spout. Long-lasting and durable. Includes new flame-mitigation device (FMD). Removes water molecules from gasoline or diesel fuels with water-absorbing polymers that restrict fuel flow when its time to replace. Use to replace element of No.496 (636-4897) water-absorbing fuel filter, will fit No.495 (SKU 636-3667) fuel filter. EPA/FMD Replacement for No.596 Water-Block spin-on fuel filter. Push button control, simply press the button to pour. Auto stop, nozzle automatically stops the fuel flow when the target tank is full. Fast flow rate, no gurgling or interrupted flow. Large neck opening, wide, stable design. Three handles on each can. Finger handles on each nozzle, and a finger slot on the bottom of each can (rear handle on the 5 gallon). The top handle is for carrying. Professional quality, thick skin, up to 70 percent thicker than other brands. EPA/FMD EPA-approved diesel fuel can. Thick can walls and sturdy fuel spout. Long-lasting and durable. Includes NEW flame-mitigation device (FMD). 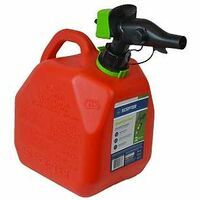 EPA-approved gasoline fuel can. Thick can walls and sturdy fuel spout. Long-lasting and durable. Includes new flame-mitigation device (FMD).